1. Norah Day, The Planets, Gustav Holst. 3. Why your Press Releases get ignored. CHORAL SOCIETY WebMag is now on Facebook. Like or Not Like? There is also a Group page where you can take part. The site receives over 35,000-40,000 hits per month! With this level of traffic, it is mutually beneficial to have reciprocal links. Please tell your web-master. This site is changing and developing as a result of your input and my self-indulgent additions! Here’s a list of contributors’ Facebooks. Need Choral Singers? Ask here! Let me know if you would like to be added. There is not enough room to list individuals excepting composers, soloists, accompanists, conductors, etc. Do you know what these mean: â€s Â£? When you e-mail me concert details please send them as PLAIN TEXT. If you use html I have to strip out the formatting to reveal the 10% which really matters. What you see above is typical of what I have to translate into an apostrophe and pound sign. Thanks! Frequently I am asked by singers where can they find a choir. The best answer is to try these sources first. If you are a choir then make sure you are listed on these web-sites..
See the Composers & Performers page. 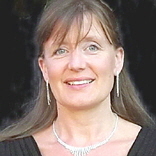 I receive quite a few e-mails from Composers and Performers who are offering their skills to choirs. Until now I have had to explain that ChoralSociety is a WebMag and not a choir and so does not commission people. In the interests of furthering Choral Music, I now welcome contributors. Please e-mail me your details so that I can list you appropriately. Here is a new app for the iphone to help you become note-perfect! Click this link to learn about Learn my part. You can click on FEEDBACK to send me a message but e-mail is quicker. Archives from 2007 to 2011 can now be found under Links & Archives. Don’t point to specific files because their location might change! Thanks to Madeleine Cordes who runs Maddie 4 Music, a music education initiative set up in September 2011 which provides music tuition in the Dover and Deal area. It includes choirs and singing groups, music workshops and performance opportunities, classroom music and instrumental and voice lessons. Maddie's Melody Makers is a small group of experienced young singers aged 9-18. They sing musical theatre, pop, soul, gospel and classical at high profile events and locations in East Kent. In December 2012 they were named as one of the three runners up in the Brewers Fayre "Carol Factor" competition. The Landmark Show Choir (another of her ventures) was established in September 2012. The repertoire comprises uplifting music from the shows through to pop and gospel and more serious if you like! The group now has 20 permanent members. It is open to all and there is no audition. It meets in the Cleary Room, Landmark Centre, Deal, Kent on Fridays 4.30-5.30pm, £4 per session, pay as you go. Interested? Contact Maddie through her web-site. Tired of singing the same old thing? Want something different? Music Notation and scanning software interests me very much. I have just been introduced to Music Publisher by Kay and Peter Bates. Has anybody else tried this? Read more. John Hooper is a like-minded singer, musician and doer of all the sort of things which would interest you. The title of his site is "John's (downloadable) Midi File Choral Music".Go to www.learnchoralmusic.co.uk where there are lots of Midi Files that might be of assistance to Choral Singers far and wide. Also very good advice on how to play midi files and what NOT to expect when you play them. He has a new web-site which I don’t find the easiest to use! The Silver Programme is a part of the overall Sage Learning & Participation Programme. It provides a wide variety of daytime musical activities for the over 50s, including singing. There are sessions at Sage Gateshead and elsewhere in the North East. Participants work with experienced and accessible tutors. Through workshops and performances the Silver Programme expands the current and dormant skills as well as encouraging new ones in Rock, Folk, Americana, Skiffle, Bluegrass, Mandolin, Guitar, Wind, and much more visit here to see what is on offer. Silver Singers is a community Choir for anyone over 50 who likes to sing. The material is a mix of world music, popular songs, folk songs, spirituals, Geordie songs, anything from Cole Porter to Annie Lennox!, Silversmiths: Blues, jazz, gospel. Silver Divas: Performance orientated group for men and women working on everything from popular songs to Broadway classics. Opera d’argento: Workshops offer the chance to work on operas and operettas. Shades of Silver: Mixed repertoire, including popular classical, pop, music from the shows. Silver Breves: Classical music singing group seeking a challenge. Elizabethan madrigals to contemporary settings of religious works. Silver Chorus: Auditioned SATB choir with a mixed repertoire of show tunes, pop, folk, classical, world and gospel. Solo opportunities within choral arrangements. Mood Indigo and Project Singing which are audition only ensembles. 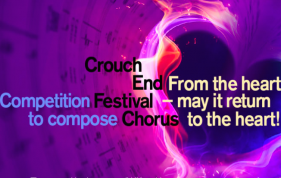 Crouch End Festival Chorus is inviting composers of all styles and traditions to submit an original setting of these words for unaccompanied choir The winning entry will be premiered at the Queen Elizabeth Hall in London this October, alongside Beethoven’s Missa Solemnis. The competition is open to all UK-resident composers, regardless of experience. Entries must not be longer than five minutes and must not have been previously performed. The closing date for entries is 1 May 2019. The winner will be decided by a panel of judges led by CEFC’s Music Director David Temple MBE and including the renowned composer Debbie Wiseman OBE. It is also permissible to set a translation of these words in any other language. No other text may be used. Encore Publications has introduced me to June Nixon’s attractive arrangement of The Holly and the Ivy, based on a traditional French tune. This was featured in the Festival of Nine Lessons and Carols broadcast on BBC radio from King's College, Cambridge, last Christmas Eve. Her carol was also included in the traditional televised celebration, Carols from King's. Interestingly it is in a minor key finishing with a major cadence. You can hear it on YouTube here This is with organ accompaniment but the composer’s orchestral version is available from the publisher. You might also consider some new works by Canon Chris Chivers. Diptych, God made a Garden, The Kohima Epitaph and Ubi Caritas et Amor. Thet are written for unaccompanied voices. His son, also Chris, has written Born in a Stable, a carol for unaccompanied mixed voices. If you go here, you will some some sample pages of the scores as a pdf. You can buy the scores from Tim Rogers of Encore. There is always something going on at Canterbury Cathedral. 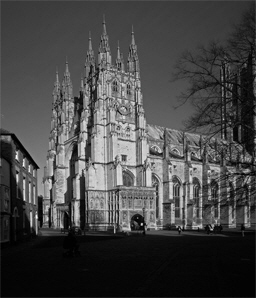 Throughout the year our Canterbury Cathedral Volunteer Graffiti Researchers can be found in the Cathedral investigating and recording its graffiti. Volunteers are happy to share their discoveries, so please do stop and talk to them to find out more about the fascinating marks made on this historic building. See-through Stories: Windows on the World is an upcoming series of six presentations that will be given by leading public speakers looking at Canterbury Cathedral’s collection of stained glass windows, the biblical figures they illustrate and their relevance for today. Talks by Rabbi Dr Deborah Kahn-Harris, Professor Vincent Lloyd and Professor Ben Quash and Dr Michelle Fletcher will take place on 1 May, 8 May and 15 May respectively. Four Close Constables were sworn in as Cathedral Constables at Canterbury Magistrates Court by Mrs Karen Dibble, Chair of the Bench of East Kent Magistrates. 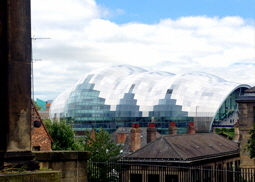 I have been asked whether I know of any concert venues in the North East other than The Sage Gateshead! Here are some I know. Newcastle City Hall This has a very fine Harrison & Harrison organ which is in need of money for restoration. Pics here soon. Lit & Phil Intimate, particularly good for small groups. Pics here soon. Mining Institute hall seats about 200 but it is very intimate and would suite a small chamber choir and a cappella gigs. Pic here soon. St. Willibrord with All Saints A most beautiful Georgian church which has been displaced in affection by the Sage, on the opposite bank of the Tyne. Needs to be used plus TLC. Pic here soon. The Cluny, Ouseburn Situated in a reawakened community just outside Newcastle city centre. Pic here soon! !St Peter's Church, Monkwearmouth,, Monkwearmouth, Sunderland. Custom built Copeman Hart 3-manual organ. Café and shop. Pics here soon! St. Andrew's Church, Roker, Sunderland. Spectacular Arts & Craft church. Forster and Andrews organ. Please send your suggestions and details of your gigs. There is loads of music in the North East, choral in particular. Are your concerts a sell-out? Rupert Street talks to Di Masters, former Publicity Manager of Ashtead Choral Society and discovers that it Pays to be Pushy. Remember the Easton Rabble Chorus? Fancy a trip to Ipswich? Easton Rabble Chorus’ repertoire is very eclectic. Folk songs, 'pop' songs by bands like Divine Comedy and the Kinks, world music, songs from musicals and the odd bit of classical for special occasions eg. Really Big Chorus events. Basically they perform whatever their MD, Kirsty Logan, feels will work for the voices and has time to arrange! Take a look on YouTube here to see a choir really enjoying themselves. Davies Music also represents the London Handel Orchestra and QuintEssential Sackbuts & Cornetts who can provide specialist accompaniment for baroque music concerts. Do you bother to look at the Composers’ & Performers’ Page? If you do you will have seen the new entry for Nicola Hooke. She is coloratura soprano with a broad repertoire who studied at Trinity College of Music. I used to work next door when it was still in Mandeville Place! If you are a professional singer and would like to be added to the page, please e-mail me. There is a lot on offer. Click here to see forthcoming events. The Recital Room is downstairs, not what you see here! Click on the pic if you want to see the library in its magnificence. The Lit & Phil Institute has the largest collections of CDs (8,000) in the world and 10,000 LPs . You can borrow or you can listen in their new facility. Do you ever complain and wish somebody would listen? Bin the Bechstein, Yamaha and Clav. Use the Virtual Keyboard to get your note. Here is something you can use on your PC. You can use your mouse to play the notes or you can use you computer keyboard. Try a link on your mobile. Here’s an experiment you can try now. When I started learning the violin at the age of seven, I learned that all pianos are out of tune! To the violinist’s ear, you heard a 5th etc as perfect intervals. It wasn’t my ear! 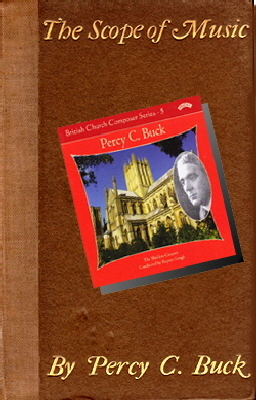 Some years later I discovered ‘The Scope of Music’ by Sir Percy Buck (he taught me harmony and composition). Like all of his books, it is easy to understand and is fairly compulsive reading. Here is an extract with an experiment you might like to try. "A musical sound has three characteristics: pitch, intensity, and quality. We have discussed pitch and intensity, and I now want to tell you how your ear distinguish between two sounds of different quality. It may surprise you to know that, just as nearly everything we have ever tasted is a combination of certain elements which a chemist could analyse, so almost every sound you have ever heard, even when you thought it was a single note, is a combination of other sounds. If you would like to train your ears I beg you, when you get home, go to the piano and strike the C which is two leger lines below the bass stave. Strike it hard several times, holding it down the last time, and listen attentively until it is almost inaudible. After a very few trials - possibly the first time - you will notice there is another note sounding strongly, the G in the top space of the bass stave. After a few more trials you will plainly hear the E on the bottom line of the treble stave. You will then have discovered a fact known for ages to men of science, viz. that a note is almost invariably a combination of sounds. These various sounds which combine to form a note are called the ‘Partial Tones’ of that note, which is itself called the ‘Fundamental Partial’.” Read the full section here. 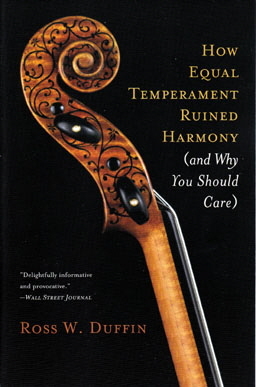 When I had the pleasure of meeting Poppy Holden recently in Newcastle, she introduced me to “How Equal Temperament Ruined Harmony”. 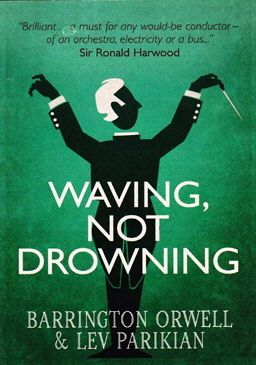 This is a fascinating book written by Ross Duffin who is a Professor of Music. After reading this you might wonder whether you are always singing out of tune! Recently I had to return hired scores to their owner. When I cleaned them up, it was very interesting to see singers' markings. Of the thirty copies, four had no markings at all. Only two-and-a-bit marked the next note overleaf. Altos were the most prolific writers. The parts with most Big Breaths marked were the sops. One score had the corner of every page turned over excepting the covers (ugh!). Men scored lower than the ladies but then they don't read maps, they don't ask for help when they are lost and they don't turn round. Mind you, ladies can only read maps upside down so perhaps they need more markings. 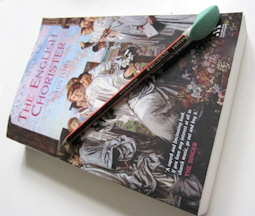 It was pleasing to see that nobody had used a ball-point or a yellow highlighter (double-ugh!). Wonderfully, all scores were returned. Make your comments on FaceBook or e-mail Web-master.